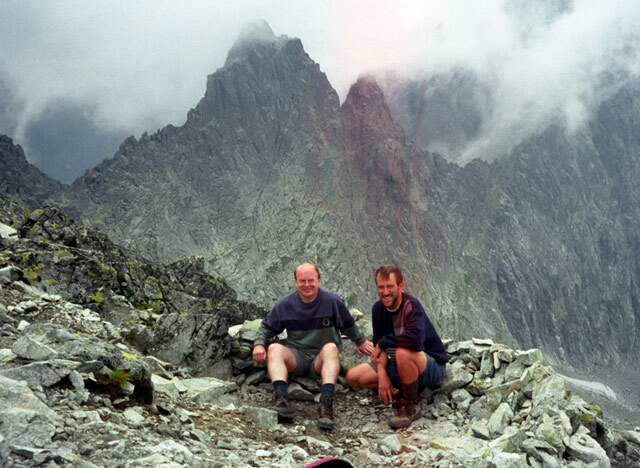 This is a diary of my 1999 walking holiday in the Tatra Mountains with Tim, an old university friend. Tim had managed to obtain leave from his usual domestic duties by taking his two daughters, Katrina (6) and Tatiana (3), to stay with their grandparents in Nürnberg. The Tatra mountains consist of two quite separate ranges. The High Tatras, situated on the border between Slovakia and Poland, are steep, jagged mountains which rise dramatically from the surrounding plains, to a maximum height of 2655 metres. The Low Tatras are to the South, on the opposite side of the Poprad Plain, and are much gentler, more rounded and greener, rising to 2043m. Tourism is well developed in the High Tatras, but much less so in the Low Tatras. We had decided to visit both areas, choosing Telgárt as our base in the Low Tatras, then moving on to Starý Smokovec, which is the central resort in the High Tatras. I was up early for the 6.00 train from York to London. The pleasantness of this journey contrasted sharply with the next, on a crowded Piccadilly Line train to Heathrow, on which I had to stand for most of the journey. My BA flight, the 11.05 to Prague, was delayed by about 25 minutes awaiting a take-off slot, which I was not pleased to hear as I didn't have a lot of time in hand to get from Prague Airport to the main railway station, where I had arranged to meet up with Tim on the 16.06 'SuperCity' service to Ostrava. In the event, most of the lost time was made up during the flight, and after finding where to buy tickets (a newsagent's kiosk), I made my way by bus and metro to Hlavní nádraží (the main station), arriving with just over half an hour to spare. I bought my train ticket (with 50% reduction for rail staff, this was Kč295, about £5.50, first class including 'SuperCity' supplement), then joined the train and found Tim already on board. The train is a fast one by Czech standards, covering the 358km (222 miles) non-stop in 3hr 46min. We each obtained a coffee and a can of beer from the trolley service, and we were pleasantly surprised to find that these were free of charge. Ostrava is an industrial town, and the only reason we chose it was for convenience. I had chosen the hotel, the 'Palace', from its description in the Rough Guide - 'Communist-era luxury hotel that can't quite pass muster in that category any more'. Dimly-lit corridors, decorated in shades of brown, cheap furniture, but clean and in my opinion perfectly adequate and a good introduction to Eastern Europe. The town was strangely quiet in the evening, with few restaurants to choose from, but we settled on the 'Astoria' and had a very good meal there, with Budvar beer. The hotel provided a surprisingly good buffet breakfast, and after catching the tram to the railway station my first task was to buy a ticket to the first station in Slovakia, Čadca (I was using a free pass for travel in Slovakia). The woman at the ticket office spoke neither English nor German, so I resorted to the phrase-book (Lonely Planet) and she directed me across to the international ticket office (signposted only in Czech - well, they wouldn't want foreigners to find it, would they?) where again I had to use the phrase-book, but I got the ticket I wanted. Our first train took us over the border (2 more stamps in the passport) to Žilina. From here we had two options: a series of four local trains, or an express all the way to Košice via Poprad Tatry, followed by another express to Telgárt. Although a long way round, it would only take half an hour longer and provide first class accommodation all the way, so we took this latter option, which also usefully provided time at Košice to obtain Slovak currency from a cash machine and a snack for lunch. 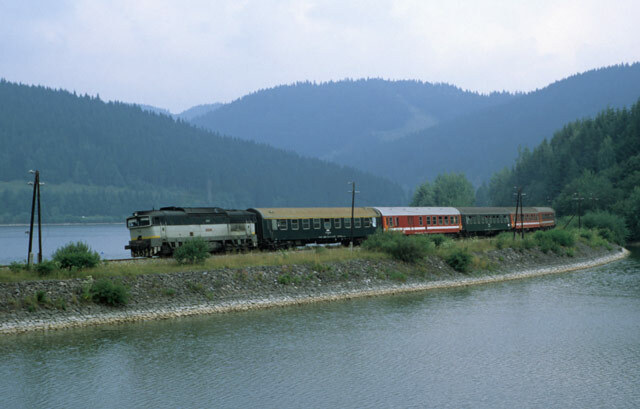 The journey on to Telgárt is quite scenic, passing through an area of hills, forests and lakes known as Slovenský raj (Slovakian Paradise), before reaching a summit at the head of the valley, then the railway drops via a spiral to Telgárt at the head of the Hron valley. Walking along the road from the station into the village, we passed a number of people selling fruits or mushrooms to passing motorists. There were more such people in the centre of the village, and it was then that I realised that these people all had dark skins and hair, and must be Roma. A map at the village centre helped us find the Hotel Telgárt, which was rather larger than I had imagined. The reception desk appeared to be disused, and a door next to it, marked Recepcia with a paper label, was locked. We decided to look for staff in the restaurant, and someone took us to a first-floor office where the formalities were dealt with and we were shown to our room, which was rather bare and had even cheaper-looking furniture than the last hotel. Showers and toilets were down the corridor. Later we had a walk around the village, which was quite pretty. There seemed to be just two places we could get a meal - our hotel or the Penzión u Hanky. We chose the latter, where the staff spoke English and provided a good meal. Beer on offer here was Urpin, from Banská Bystrica, the nearest large town: pilsner at Sk20 (31p) or dark beer at Sk15 (23p) for half a litre. We had decided on an early start, so we were up before seven. This is when we discovered that there was no hot water, so Tim's shower was a very quick one (and I didn't bother with one). We were down for breakfast by about 7.15, but we didn't know what time breakfast was served, although Eastern Europeans are normally early risers. The signs outside the restaurant showed the opening times as 0900-2200, but surely that was for non-residents? We went in anyway, where we were the only customers, and we were served, but somewhat grudgingly. We called at a shop to buy some bread, bananas and chocolate for our lunch, and while we were still in the village we were surprised to hear music suddenly start to emerge from loudspeakers which were mounted on lampposts all over the village. I thought that sort of thing, compulsory muzak/propaganda/whatever, only happened in Russia and China. Our initial destination was the nearby summit of Kráľova Hoľa (1948m, 6391ft). Our starting height was about 850m, giving us about 1100m (3600ft) of continuous uphill walking, quite steep in places, initially through forests and fields, but open grassland at the top, which we reached in a little over three hours. At the summit is a radio mast and a derelict building which may once have been a café. The summit was in cloud, so we were unable to see much, and it was quite windy, so we found a sheltered spot to eat our lunch. We descended by a different route emerging into sunshine, and followed a path down a picturesque valley alongside a stream with waterfalls, until we reached the main road at Puste Pole. We decided to continue eastwards, with the aim of reaching Dedinky and catching a train back from there to Telgárt. Unfortunately this meant that a lot of the walking would be along roads, but it gave us the opportunity to take some photographs of trains on the way. 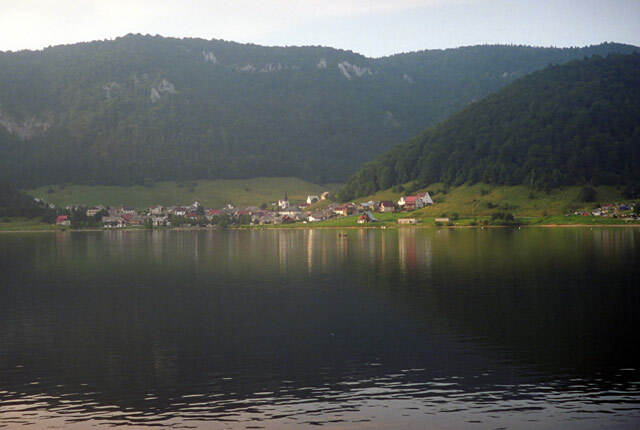 Dedinky is a village alongside a man-made lake, situated in the Slovenský raj, and seemed to be much more of a tourist destination than Telgárt, with cafés, hotels and boats for hire. The train back to Telgárt was on time. We toyed with the idea of eating at our hotel tonight, but decided to stick with what we knew was good, so after a cold shower it was off to the Penzión u Hanky again. The weather was cloudy this morning, so we planned a walk eastwards towards Dedinky, possibly via Dobšina, which had plenty of possibilities for shortening it (returning from a different station) if the weather turned bad. We decided to see if Penzión u Hanky offered breakfast to non-residents, and they did, so we ate there. There were no summits today, just a pleasant walk through forests and meadows. One thing we noticed on yesterday's walk and again today was the unhealthy condition of many trees. A number had fallen, and many others appeared to be rotting at the base of the trunk, and had their lower branches covered in a green lichen or fungus. Could this be due to acid rain? In the end it was not the weather which curtailed today's walk, but the condition of my feet, which had become blistered yesterday (probably due to the amount of road walking) and were now becoming painful, so we cut out the detour to Dobšina and headed direct towards the lake near Dedinky. On this side of the lake is a village called Dobšinska Maša, and here we had a late lunch at the Raj Hotel (pronounced 'rye'), consisting of sausages, mustard and bread with Smädny Mnich beer, which went down very nicely. We caught the same train back as yesterday, and ate once more at Penzión u Hanky. As we were due to leave the hotel in the morning, we decided to settle the bill this evening, so we went into the restaurant, from where we were taken to the same office as on Thursday. Here there were several women sat chatting (presumably hotel staff) and a boy playing a football game on a computer. We paid in cash (Sk600, about £9.20, per night for the room) and the woman who took our money asked if everything was to our satisfaction. Being English, I found it impossible to tell her that it was probably the worst hotel I had ever stayed in, but I did mention the lack of hot water, to which she didn't really reply. She advised us that breakfast tomorrow would be at eight. During the night, we experienced a violent thunderstorm, with flashes of lightning and crashes of thunder every 2-3 seconds. We tried to leave the hotel at 8.00, but found the main doors locked, and no-one around to let us out. We spent a few minutes trying to find an alternative exit (such as a fire escape) without success, but then a member of staff arrived and unlocked the main door. We breakfasted at Penzión u Hanky once more. Today we were travelling to Starý Smokovec, but, as usual for Tim and myself, we did not take the most direct route. We travelled east to Kysak, and then caught an international express, the 'Karpaty' Bucharest to Warsaw train, as far as the Polish border at Plaveč. This train was an hour late, which meant some hanging around at Kysak, and again at Plaveč as we had missed our intended connection. At Plaveč there was a small buffet where we each purchased a banana and a bottle of beer. A slow journey to Studený Potok followed, where Tim made an undignified exit from the train, missing the step and falling down onto the low platform. We took the branch train to Tatranská Lomnica, and from there the narrow-gauge electric train to Starý Smokovec. We were unsure of the exact location of our hotel, the Hotel Smokovec, and could not find it on a display map, but eventually spotted it, quite close to the station. Much to our relief, it was several orders of magnitude better quality than the Hotel Telgárt. We had a good meal at the hotel. 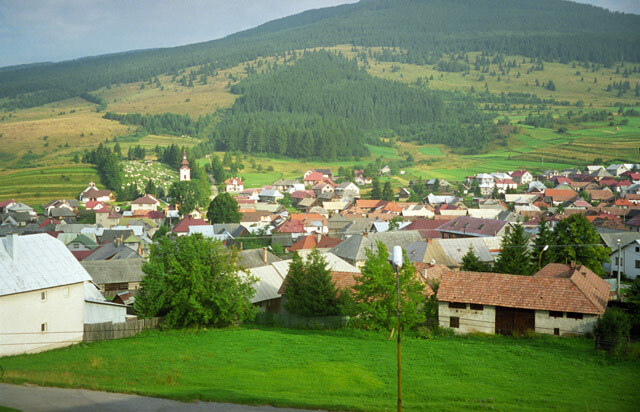 The view of Telgárt village, from our hotel. This view was the only good thing about the hotel. For today we had decided on a walk to the nearby summit of Slavkovský štít (2452m, 8045ft). We had a good buffet breakfast at the hotel, and each took with us an apple and a bread roll for lunch. We decided not to bother with the funicular which runs up to Hrebienok, which would have saved 250m of climbing, but to walk the whole way, and therefore climbing about 1450m (4760ft). For the first hour, this was through pine forests, uphill but not unduly steep. Higher up, the vegetation changes to dwarf pine, and the path steepens and then emerges onto bare rocks and large boulders. The path continues, steeply uphill all the way, eventually reaching a ridge. Following the ridge, the gradient lessens just before the top, which enabled us to see the summit just 100 metres ahead, with about two dozen people sat around on the rocks. It had taken us 4 hours, compared with the 5 hours indicated on the signpost at Starý Smokovec (all the paths are clearly waymarked, with estimated walking times given on signposts). We joined the crowds on the summit, ate our lunch, and after about half an hour returned downhill by the same route most of the way, but diverting to the top of the funicular at Hrebienok, where we had a refreshing Tatran beer. We walked back down to Starý Smokovec following the route of the funicular. After a nice warm shower (luxury!) we walked to the nearby Grand Hotel for a meal. Both Tim and I had stayed here previously, on separate occasions, so it brought back memories for both of us, eating in the spacious dining room. This was the most expensive meal we had eaten so far on this holiday, 3-course meals for two, with beers (Zlatý Bažant) coming to about £13. Our choice of walk for today was to cross the mountain range from south to north via the saddle at Sedielko. Although this would not include the ascent of a summit, Sedielko is, at 2372m, only 80m lower than yesterday's peak. This morning we took the funicular up to Hrebienok in order to reduce the climb. From here, the path follows the cascading Malý Studený potok (Little Cold Stream) up a very attractive valley. From a distance, the head of the valley seems to be hemmed in by a near-vertical wall, but on approaching, the path becomes discernible as it steeply zig-zags its way up over the large boulders. After this climb, the path emerges onto a strange, rocky plateau with several tarns, on which is situated Téryho chata (chalet). From here, another wall of mountain looms ahead. Again, as we approached, the route became clear, climbing up steeply to a notch in the skyline above. 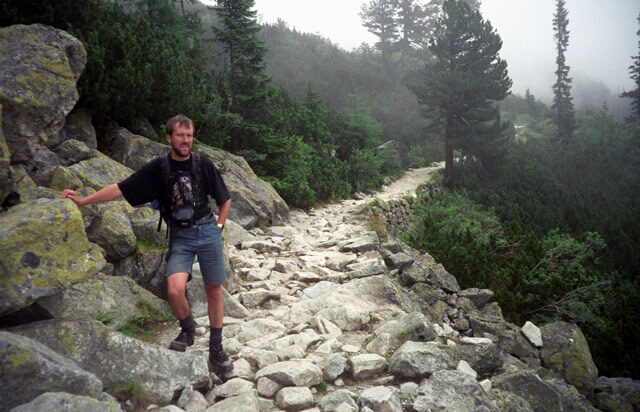 To our left, a path diverged towards Priečne sedlo, which looked even closer to vertical from where we stood. Our path climbed relentlessly upwards in a series of zig-zags over the scree, and seemed to steepen as we climbed. Here we met up with a Polish guy, Paweł, who walked with us the rest of the way. After a final short but very steep scramble, we emerged at the top of the pass. Paweł pointed out some of the other peaks visible, including Rysy (2499m), on the Slovakia/Poland border, which is the highest peak on the waymarked route network, and the highest point in Poland. The descent on the north side is less steep, and follows a valley down to the village of Javorina. Here we found the bus stop, checked the timetable, and, as we had half an hour to wait, went into the bar across the road for a delicious cool glass of Smädny Mnich (it means Thirsty Monk). The crowded bus returned us to Starý Smokovec, with Paweł alighting at Ždiar, where he was staying in a private room. Tonight we ate at Villa Dr Szontag, a hotel in nearby Nový Smokovec. The day dawned cloudy, and I was also suffering from a slight upset stomach. I managed a light breakfast, but was not feeling up to an ascent of Rysy, which is what we had planned for today. Because of the clouds, we probably wouldn't have seen anything anyway, so we decided on a train trip. 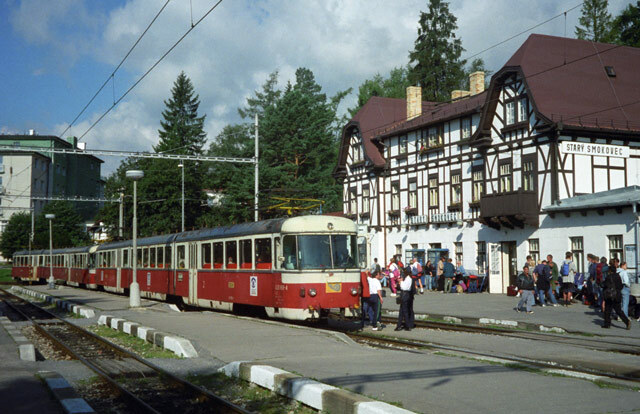 This took us via Poprad and Kraľovany (where we heard the first thunder of the day, much earlier than usual) to Trstená, at the end of a branch line close to the Western Tatras. On the last leg of the journey, the clouds started to break just as the solar eclipse reached its maximum (around 95% here), and the land was bathed in weak sunlight. At our destination we found a hotel for lunch (I was feeling better by now) but we didn't have much time to linger in the town (there wasn't a lot to see anyway) before catching the train back. The Trstená branch is quite scenic, following the River Orava much of the way to the junction with the main Bratislava to Košice line at Kraľovany. Back at Starý Smokovec, it was a meal at our own hotel tonight, and we retired to bed hoping for another chance at Rysy tomorrow. It was raining quite heavily in Starý Smokovec, so we were a little undecided what to do even as we set off. The starting point for the walk to Rysy was further west along the railway, so we caught a train and alighted at its destination, Štrbské Pleso. If it had still been raining, we might have continued onwards by train, but as the rain had stopped, we decided to start walking, as there were a couple of alternative routes we could take if the weather was not suitable for going very high. After the usual uphill walk through the pine forests, we came to Chata Popradské Pleso, where we had the option of continuing on the Tatranská Magistrála, a path which runs west to east along the southern edge of the High Tatras, largely following the contours just below the tree line. As it was still fine, we decided to take the path upwards towards Rysy, but there was another decision point further ahead, and as by then we were into the clouds, we decided to take the lower path towards Veľké Hincovo pleso, a tarn which had been described as 'very pretty' by a Slovak girl we had met on Monday. When we got there, visibility was less than 100 metres, so we were not able to appreciate its beauty. We had the option of continuing along the same path, which eventually would take us back down to Podbanské, where we could catch a bus, but as it had started raining we decided instead to retrace our steps back down to Štrbské Pleso. It was still only early afternoon, so to fill in the rest of the day we went by train to Levoča, a historical walled town, where we had a quick look around and visited a museum. Back at Starý Smokovec, we ate at our own hotel again. It was cloudy again this morning, but the clouds seemed to be breaking, and our hotel receptionist was kind enough to make a telephone call to obtain the weather forecast for us. 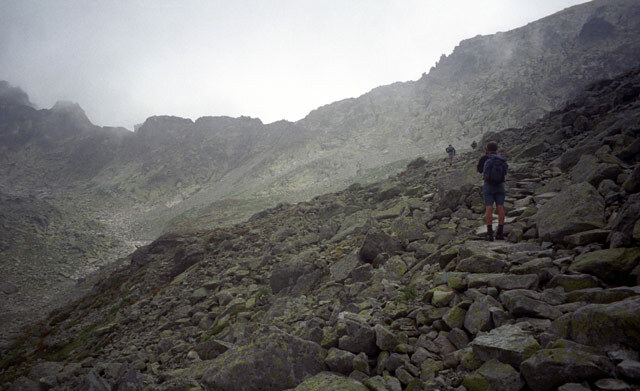 'Fine but cloudy' was the reply, so we were away by 8.15, following a path which climbed steeply through the forests, then through dwarf pine, until we reached Sliezky Dom, an ugly concrete hotel at 1663m. We paused for a rest by a tarn, and by then the cloud base was not far above us, perhaps 100m. Our plan was a circular walk via two saddles, described by my guidebook as one of the most exciting on the waymarked network. Tim had some doubts as to whether we should continue, but I was determined to - the path was easy to follow, plenty of other people were going that way, and it would have been a terrible anti-climax to the holiday if we'd abandoned this walk on our last day. We continued, steeply uphill over rocky ground, until we came to the final scramble up to the first saddle, Poľský Hrebeň (2200m). There is a fixed chain on this final ascent, to provide a hand-hold, but we found that it wasn't really necessary, in dry weather at least. We didn't linger, but descended by about 100 metres on the other side (which is less steep), then at a junction took the right-hand path up to Prielom, a steep scramble over rock, the final part of which again has a fixed chain, and is considerably trickier than Poľský Hrebeň. There was some congestion here, as it is difficult for people to pass in opposite directions on the chain. A girl of about 12, coming down the chain, was clearly very frightened, and was not helped by three impatient youths who avoided the chain, climbing higher up and dislodging loose stones which showered down on the people below. Prielom (2288m) is just a narrow notch in the mountain ridge, and there was little room for the number of people there. The clouds had lifted a bit since earlier, but not quite enough to clear the ridge and we never really got a good view of the surrounding peaks. The descent was less steep, though with a scramble over rocks in a few places. At Zbojnícka chata, we had a coffee and a bar of chocolate each, the coffee being like that I had come across in Poland a few years previously, with a thick layer of grounds at the bottom of the cup (the Slovaks call it Turkish coffee). We followed the valley all the way down, with the river alongside being a continuous series of waterfalls in places. This took us to Tatranská Lesná, where we had just 10 minutes to wait for a train to Starý Smokovec. It had been an excellent walk to finish off our holiday. This evening we decided to look for somewhere else to eat, and after a short walk spotted the Koliba Penzión and Restaurant. It turned out to be quite a large and well-filled restaurant, with live music from a string trio. They played all those Eastern European pieces which are familiar but you can't put a name to: Hungarian Dances/Rhapsodies, Mazurkas, even some Russian and Greek pieces. The food was good too, and we enjoyed the atmosphere so much that we stayed for another Zlatý Bažant after finishing our meal. Today we travelled from Starý Smokovec to Prague. The morning was bright and sunny, and it was a shame not to be walking again. We caught the 8.51 local train to Poprad Tatry, where there were huge crowds waiting for the Bratislava train, which we travelled in as far as Žilina. Fortunately we were travelling first class, and had no problem finding a seat. At Žilina we took the connecting train which crossed the border into the Czech Republic (no stamps in the passport this time) and continued on to Prague. This train did not have any refreshment facilities, despite it being a 10-hour journey to the train's ultimate destination of Cheb. I was able to nip out at Pardubice to buy a couple of sandwiches from a kiosk on the platform. We arrived in Prague on time at 18.11 and took the metro to our hotel, the Ibis Praha Karlin. This turned out to be the same hotel as I had used on my first visit to Prague in 1991, although it was called something different then. Prague is one of my favourite European cities, and we decided to walk into the centre rather than eat at the hotel, even though we didn't really have any time to look around. We chose a pizza restaurant listed in the Rough Guide, on the edge of the Staré Město (old town). It is often said that Prague is now as expensive as any city in the West, but we each had a large pizza, 2 beers (Kaiser Bier from Lobkowiczky Pivovar) and a dessert, and the bill for the two of us came to just Kč402 (£7.55). Overall verdict - My first ever walking holiday, and I really enjoyed it. It won't be my last. 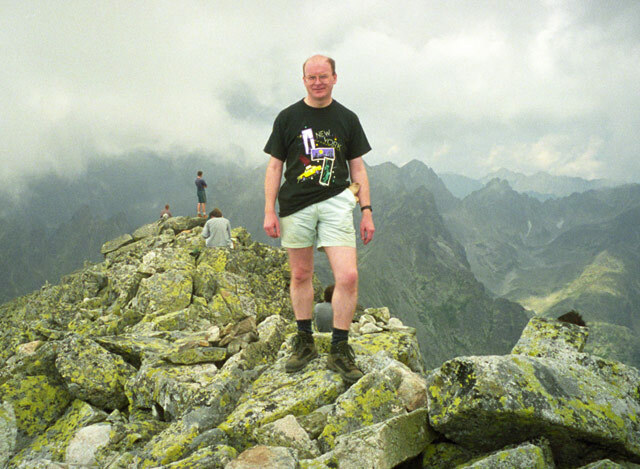 The facilities offered in the High Tatras are well up to international tourist standards, and the walks are well-signposted and easy to follow.